As recently as the 1990s this place was simply a street with some arresting views of the city, but not something tourists went out of their way to see. Over the last two decades however, slow and steady changes have made this one Belo Horizonte’s most indispensable tourist trap. Today, it’s a tree lined boulevard of two wooden decks, with jaw-dropping panoramas of the city, framed by the near hills and the distant mountains. The gazebo is about 34000 square metres, so there’s a lot of space for strolling. Get your camera, and start clicking. The people watching isn’t bad either. Love this? 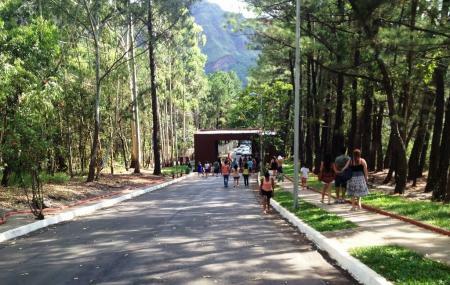 Explore the entire list of places to visit in Belo Horizonte before you plan your trip. Fancy a good night's sleep after a tiring day? Check out where to stay in Belo Horizonte and book an accommodation of your choice. How popular is Mirante Mangabeiras? People normally club together Palacio Das Artes and Serra Da Moeda while planning their visit to Mirante Mangabeiras. Absolutely beautiful but closes too early and could do with information maps of where things are and their distances. Parking can be limited too but the view is incredible. Come for sunset. A place where you can have a great view of Belo Horizonte. The only problem is the access: There is no bus to go to there. You will have to walk for about 10 minutes from Pope's Square to arrive or go by car. GREAT SUNSET VIEWS!!! If you want to get the views of entire Belo Metropolis area while enjoying the stunning sunset, this is the place for you. The park is open from Dusk to Dawn. The gated location is easily accessible by Uber followed by a short walk to the viewing area. There is no entry fee for the park! The area is clean, safe and family friendly. However the only thing missing is there are no food stalls. So plan to bring drinking water and snacks to enjoy with the view! There are public restrooms but those are not too clean either. Overall a little inconvenient but the views definitely make up for it! Excellent panorama view from the top over the city of Belo Horizonte.